Now with colour LCD, simplified setup and installation, the AP47C offers the same easy to use functionality and compact styling as the AP47, TMQ’s most popular small boat autopilot. Waypoint steering when connected to a GPS plotting system. Manual Mode: The autopilot display unit shows the current magnetic heading.The vessel is under manual steering control and does not apply automatic steering control. 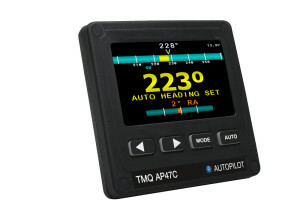 Auto Mode: The autopilot will maintain your vessel on any desired magnetic course. This course can be set from the display unit. GPS Mode: When receiving information from a GPS the autopilot can steer a vessel to a precise latitude and longitude, through any number of desired course changes. 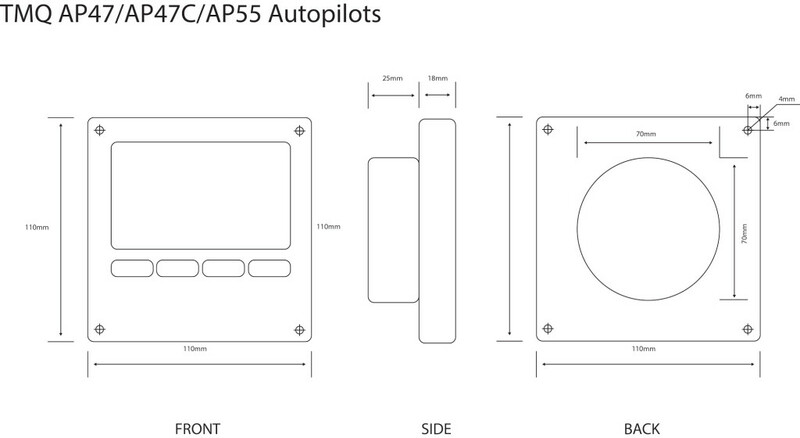 AP47C control unit, electronic compass sensor with 5 metres of cable, mounting hardware and brackets, operation manual. Support:TMQ have had 35 years of product support backed with a 2 year warranty* and benefits from localised priority service and support. *Warranty is extended to 3 years when registered with TMQ. Easy to install: AP47C is designed to 110mm standard casing.